One hundred and two patients with unstable angina pectoris were randomized into three groups: CDDP group ( n = 33), clopidogrel group ( n = 35), and combination group ( n = 34). Myocardial necrosis can therefore be distinguished from angina pectoris. Effects of spinal cord stimulation onmyocardial blood flow assessed by positron emission tomography in patients with refractory angina pectoris. symptomatic and ECG improvement reported in the included 18 articles, the review concluded that ginseng was more effective than nitrates in treating angina pectoris (P = 0. Curative effect of Danshen composite unstable angina pectoris. Time elapsed since HIV/AIDS diagnosis, the type of antiretroviral (ARV) regimen, smoking and obesity were the items of comparison selected for their association with angina pectoris. Reports suggest that sympathetic re-innervation of the transplanted heart can occur (2-6) and therefore angina pectoris should be considered in the differential diagnosis of chest pain which develops some years after heart transplantation. In men without a full diagnosis of major depression, angina pectoris, MI, coronary heart disease, and heart surgery were associated individually and significantly with an increasing number of depressive symptoms. 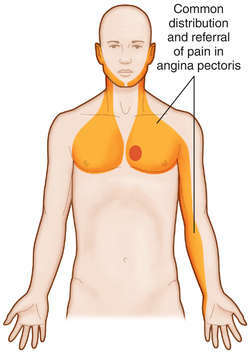 Over six million Americans live with a painful chest condition called angina pectoris, resulting from blockages in the arteries that supply blood to the heart or other coronary disease. Other health end points studied have included elevated blood pressure, angina pectoris, ischemic heart disease, use of antihypertensive or cardiovascular drugs, and consultation with a doctor (for unspecified reasons).